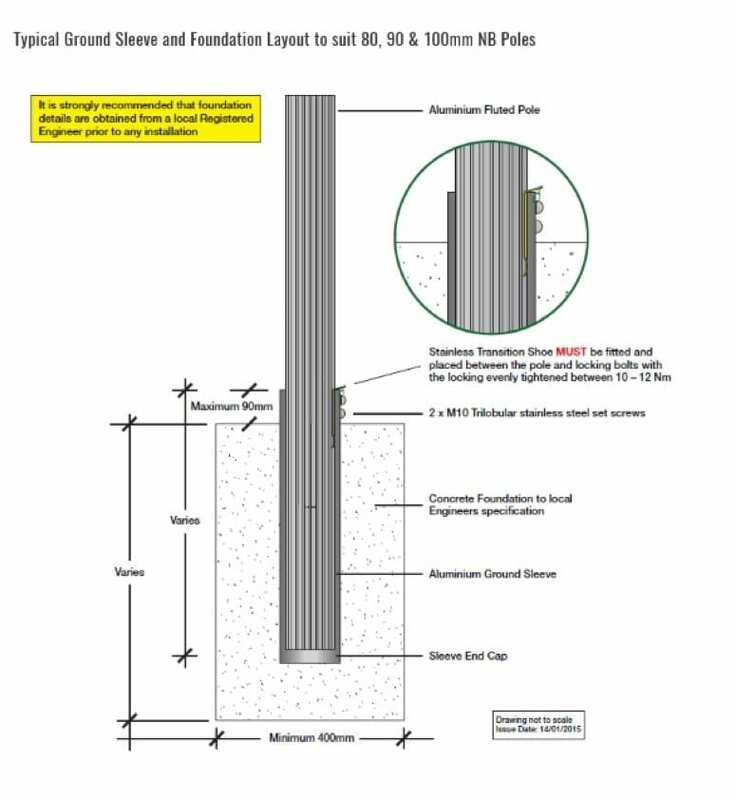 Designed to suit 50NB and 65NB galvanised steel poles and aluminium poles, Signfix ground sleeves use extracts of high strength marine grade alloy. This alloy has excellent resistance to corrosion and over the years has proven to work well with aluminium and galvanised steel poles. SLV060: 50NB 300, 400, 450 & 600mm lengths. Custom lengths available on request. SLV076: 65NB 600mm lengths. Custom lengths available on request. The external shape ensures sleeves will not rotate when set in concrete. Internal dimensions of all sleeves are designed to be a snug fit with the pole. Sleeves are fitted with PVC end caps to prevent concrete entering the sleeve during installation. Sleeves can be supplied with an M10 tapped hole located 15mm below the sleeve top, to fit either an M10 hex bolt or a trilobular security set screw. This way is ideal for securing PVC poles and in this instance, it is recommended sleeves are positioned 30mm above ground level. Designed to suit 80NB, 90NB and 100NB aluminium poles, Signfix ground sleeves use extracts of high strength marine grade alloy. This alloy has excellent resistance to corrosion and over the years has proven to work well with aluminium poles. Sleeves can be supplied with two M10 tapped holes located 15mm below the sleeve top, to fit two trilobular security set screws.